Now I know you shouldn’t judge a book by its cover but when I saw this book as a background prop in some blog posts, it caught my eye and I was intrigued. The title was enough to sway me and although it’s unlike me to seek out a nutritional book, I’m glad I did. Eat Pretty: Nutrition for Beauty Inside and Out by Jolene Hart, guides you through how to use nutrition as a tool to get perfect glowing skin as well helping to beat stress, ease digestion and maintain a pH-balanced living. 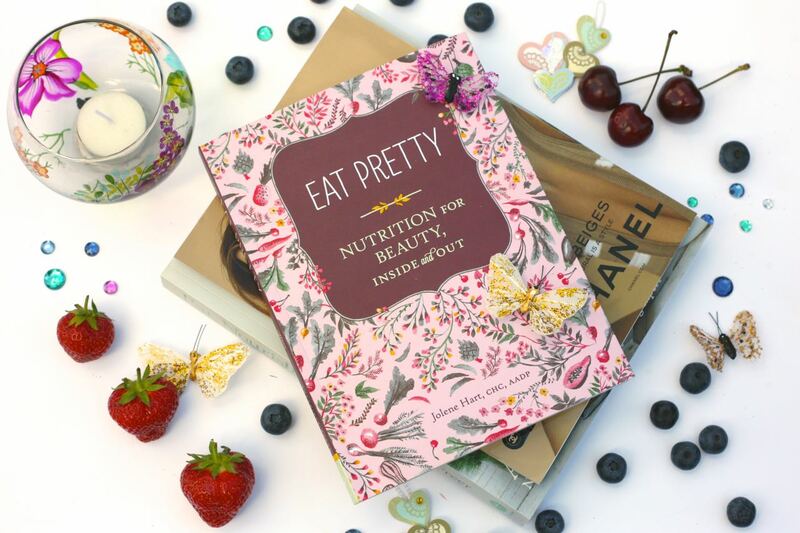 Written by a beauty editor turned health coach, Eat Pretty is relatable and easy to follow. With terminology like “Beauty Betrayers,” “The Building Blocks of Beauty” and “The Eat Pretty Pantry,” this book certainly draws you in, but that is a good thing because normally I’d be bored after the first few chapters! In fact, I’ve read this from start to finish and regularly use it as a point of reference as it covers everything from a comprehensive glossary of beauty nutrients, sources and benefits, a seasonal guide on how to eat pretty as well as quick and easy to follow recipes and how to use foods to help you sleep well and control mood swings. Like did you know that radishes are good for strong nails, red cabbage provides a collagen boost, celery keeps your skin hydrated and pumpkin seeds calm your nervous system? The great thing is that this book isn’t designed for health freaks, nor is it about following a strict regime (I have too much of a sweet tooth for that), but it’s about having the right information so that you can make your own choices and most of all, it’s about doing your best to achieve that glow from within…..who doesn’t want that?